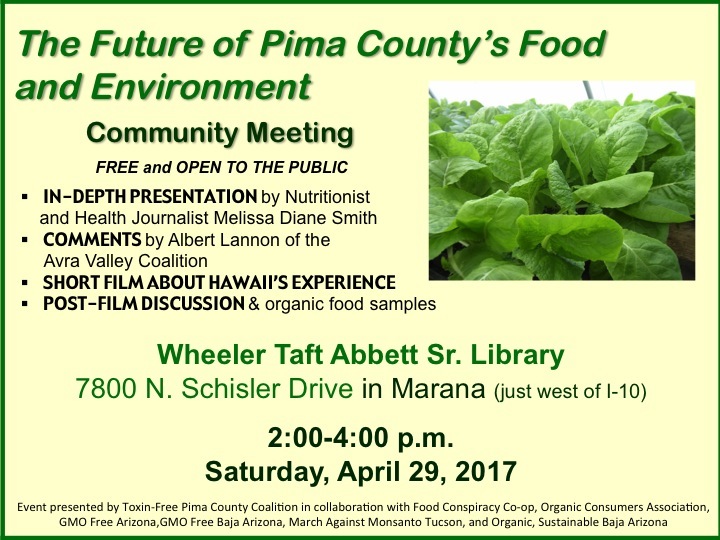 My next presentation is “The Future of Pima County’s Food and Environment” this Saturday, April 29, at 2 pm at the Wheeler Taft Abbett Sr. Library, 7800 N. Schisler Drive (just west of I-10). This special event will be the first educational event to take place in Marana about the major food and environmental issues facing Marana, Avra Valley, and Tucson, Arizona: genetically modified foods; pesticides; and Monsanto. A lot of news has come out about Monsanto and its weed killer Roundup at such a dizzying pace this year that you may not have been able to keep track of all the information. My presentation this Saturday will help get you up to speed. In addition, if you are new to the topics of GMOs and pesticides or simply need to know more than you currently know, this event may help fill in the gaps in your knowledge. As a health journalist, holistic nutritionist, and author of Going Against GMOs, I will give an in-depth, yet easy-to-understand presentation that covers the most important information you need to know. 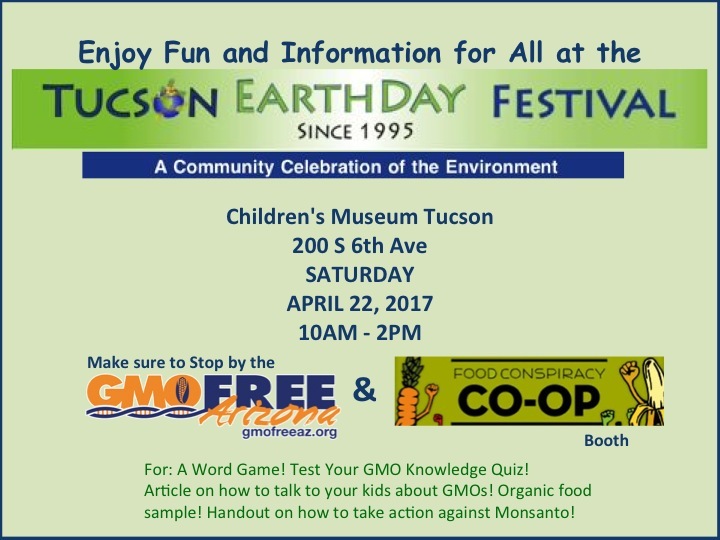 Starting on Earth Day (April 22) and running into May, our cohesive group of citizens who oppose Monsanto in Pima County – now known as the Toxin-Free Pima County Coalition, a chapter of GMO Free Arizona – will hold a series of educational events in Tucson and Marana.